Subscribe to email notifications of new blog posts. This post starts with a warning. It’s a little depressing. Heavy, even. I actually meant to publish it weeks ago but didn’t thinking about adults insulting infants, mass extinction, and animals stuffing their homes with human trash, and that only covers half of the topic! Well, we are at Shadows in Mind. Here are the type of cold shadows that creep across your room in the nighttime. This first is a nod to what was considered weird when I was a child. The general public had not yet accepted the concept of “test tubes babies”. Forty years after the first in vitro fertilization, people continue to worry about what will come of the technology other than viable human children. 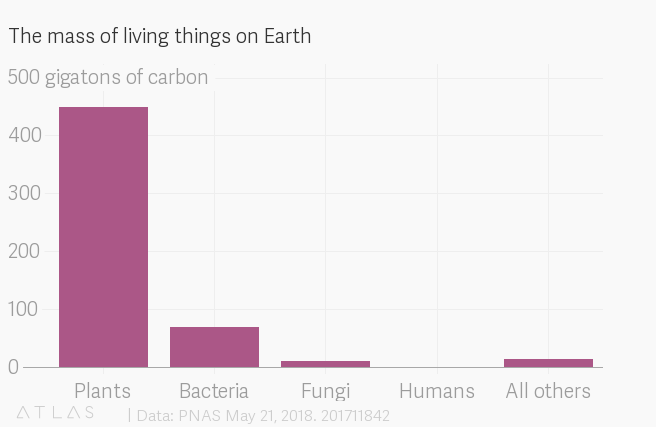 A study recently published in the United States’ Proceedings of the National Academy of Sciences (PNAS) determined that out of the 550 gigatons of carbon in Earth’s known life, humanity makes up a tiny 0.01%. Another interesting finding was that the biomass of domesticated animals surpasses that of wild mammals and birds. Quartz reports that the study also shows human civilizations have drastically destroyed the world’s wildlife. As an aside, I’ll share that the “scientists stumbled upon a plastic-eating bacterium—then accidentally made it stronger” (said PopSci in April). Apparently, humans impact the diets of the world’s life, as well. The Guardian‘s “Darwin Comes to Town: How Cities Are Creating New Species” provides examples of non-humans adapting their behaviors to life in human-made cities. What’s surprising more scientists is how animals adapt physically to our behavior. The impact of cities is not just evident in the behaviour of animals – urbanisation has also changed the course of animal evolution. In way, this is good news. While humans are destroying the diversity of complex life, fast evolution ensures that animals carry on beside us. Here’s silly news about the diversity of planets. Astronomers looking for the mysterious Planet Nine discovered instead twelve more moons around Jupiter. One of the new satellites goes in the same direction of Jupiter’s spin, making it an oddball among the scores of other moons around the planet. Imagine converting carbon dioxide, which is the toxic, climate-changing gas we and many species on this planet exhale, into affordable gasoline. However, the conversion can now be affordable. CE’s engineering work shows that AIR TO FUELS™ technology can produce fuels for less than $1.00 /L once scaled up, making them cost competitive with biodiesels. If we can shake the fossil fuel industry’s control on politicians, we can see this process put in place everywhere. If that’s a bit much to wrap your head around, think of a mechanical calculator. Nowadays it’s all done digitally in computer logic, but back in the day calculators used actual mechanical pieces moving around — something adding up to 10 would literally cause some piece to move to a new position. In a way this “diffractive deep neural network” is a lot like that: it uses and manipulates physical representations of numbers rather than electronic ones. The writer in me wants to twist this into a story about intelligent light. Previous Previous post: Tweeting Again -and- Oh, Horror!